Editor’s note: You may have missed this article when we published it last year. We’re sharing it now because it’s a critical reminder of the key ingredient for any successful content marketing program. Most marketers are so terrible at content creation because the “why” to them is about driving demand and selling more widgets. It seems too simple, but almost all brands get this wrong. We focus on what our organizational goal is and create content we believe drives that organizational goal. This works in advertising, why shouldn’t it work in content marketing? Sure, the organizational goal (e.g., sales, savings, customer loyalty) is important, but to hit that goal we must focus on the needs and wants of the audience. How can we be so useful and impactful to the audience outside of the products and services we sell? To Marc’s earlier point, the primary goal must be focused totally on the audience, and the business goal needs to be secondary. Or, maybe better said, you can’t reach the business goal without first serving the needs of the audience. Once we deliver consistent value to our audience – and they begin to know, like, and trust us – then we can extract value from that relationship. Do you want a better lead-generation program? Then focus all your energy on building ongoing subscribers to your content, and THEN create leads from your subscriber base. We’ve worked with hundreds of B2B companies in the past seven years and literally no one does this. That’s the primary focus for CMI. How do we “show” return for our efforts? We build an audience of subscribers to the content itself. Once we have an ongoing relationship with them (around their needs), and they begin to know, like, and trust us, then (and only then) do we present products (like Content Marketing World) in front of them that align with that audience need and help CMI’s bottom line. I’ll let comedian Michael Jr. explain. It’s worth the 3 minutes. Go ahead, I’ll wait. Want to learn more and be inspired by businesses that follow a subscriber-first model? 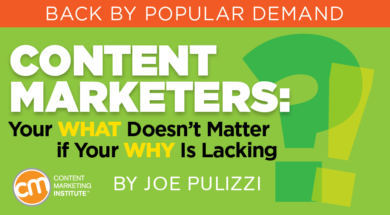 Check out Joe’s book, Content Inc. Want to be inspired by great speakers like Michael Jr.? Register today to attend Content Marketing World 2017. Use code BLOG100 to save $100 on registration.